I don't have a lot of money to spend as a SAHM, but I sure do love to window shop and look around. One of my favorite places to look is SneakPeeq, a website once mentioned on GMA for giving away free gifts or money towards a purchase just for signing up. When I saw that GMA segment, I signed up right away. What did I get? 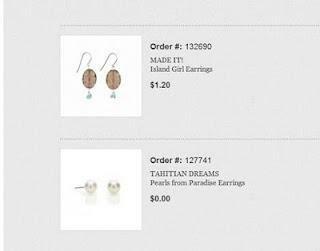 A free pair of pearl earrings! They're so cute. I wore them tonight for the first time. Just for poking around, I also scored another pair of really cute earrings for $1.20! The site has little boutiques for a variety of goods coming from stores online, with items like purses, jewelry, clothing, household items, kids items, and food. Each day or every few days there are new boutiques to view, so the items never get old. Want to take a look? Click here to find out more and get $10 towards a purchase! You have nothing to lose!